The 6ft x 4ft Reverse Overlap Apex Shed is the perfect solution for buyers wanting storage in their garden that doesn’t break the bank. This garden building features 8mm thick overlap cladding that is supported by a 28mm x 28mm wooden frame to create a rustic and attractive finish that has been designed to last. The reverse apex roofline provides extra head room on the inside, it also helps with water drainage, which protects the roof from wood rot. Quality sand felt is supplied as extra protection against the elements. The roof and floor have been built using a 9mm thick solid sheet material, this aids in providing a rigid base that won’t sag when storing a large number of items. The single door has been braced with ledging to provide additional support, a pad bolt is included for extra security. The single window is made from styrene glazing, which is 100% shatterproof, making it a safer alternative to traditional glass. Thank you for taking the time to leave your feedback, we take all comments seriously and will pass your comments to the procurement and development departments. I am glad to see that you have decided to order another item from us. Review:Very good product, fitted together nicely, need 2 people to assemble. Review:Shed is as described and arrived on time, fairly easy to put up. However the window needed sealant as it let in some rain water. Review:Very good product, looks very professional. We are happy to hear how pleased you are with your purchase and hope you enjoy it for time to come. Review:Value shed, so you you get what you pay for. Wasn't the easiest to put up and door was slightly bowed. Thank you for taking my call earlier. I will try again later so we can discuss things further and if you have any further queries, please contact me on either 0800 029 1000 or service@waltons.co.uk. It is great to know that you found our website easy to use and you were very happy with our helpful delivery driver. Thank you so much for your kind review! It is wonderful to know that you are so pleased with all aspects of the service received and also with the value for money of your overlap shed. Thank you so much for the great review. Thank you very much for you great feedback! I am pleased that you are happy with your overlap shed and that assembly was easy and you encountered no issues. Thank you again for your great review! Thank you very much for your brilliant feedback, it's great to hear that you are happy with both of your new buildings. 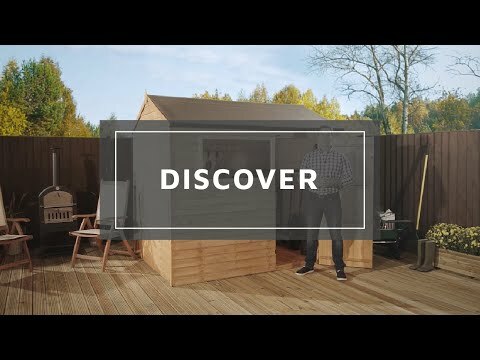 Review:Very happy with the shed our gardener put it up for us on the 8th December. Very happy with it. Review:Poor quality - flimsy shed, poorly constructed panels made out of warped wood, screws and other components missing, instructions with incorrect dimensions. Such a shame. Review:The shed is sturdy, all fitted together well, looks good and I am very pleased with it. Our Reply:Very happy to know that you are pleased with your overlap shed, that the construction went well and that the item is sturdy.